After many years of dreaming, I finally made it all the way to Patagonia. The mountains at the end of the world called and they did not disappoint. Rising suddenly with vertical towers to which glaciers still cling to, majestic and temperamental, they stay mostly hidden in the clouds they create for themselves. The fierce winds are also their creation, maybe a way to feel the surrounding landscape with invisible fingers. But what surprised me the most was the abundance of intense colors everywhere. I don’t even know how I could describe the way the entire sky lights up in the morning in vibrant colors every direction you turn your head to and stays like that for tens of minutes, then disappears, only to come back shortly after, before fading away until the next day. It’s a truly jaw dropping show and, as a photographer, it’s hard to concentrate on one subject. And the trees... Huge Lenga trees with leaves the size of a fingernail, colored more intense than I have ever seen. 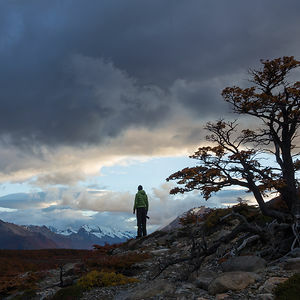 This was an adaptation to the fierce winds in Patagonia, but even so, there were many victims. The forests are full of twisted, fallen, dead and rotten trunks, and they transform radically over short distances. You go up on a hill and all the trees are small and twisted by the powerful winds, resembling beautiful bonsai trees. Descend in the immediate valley and they are straight, wide and 30 metres tall. In some other part they are the size of fruit trees, but thinner and wildly shaped. Everywhere among them, fallen trunks and huge rocks. It’s an incredibly beautiful chaos and sometimes difficult to photograph. I would love too paint a couple of your photos ?.Are they enhanced at all please. The perfect combo of winter and autumn. These are my faves. Looooove the blending of the seasons! this is not chaos... this is beautiful symmetry in the way of Natural Fractals as discovered by Benoit Mandelbrot. If you really look you can see the patterns, from the shape of leaves to the form of the tree to even the spacing of tree roots and the actual shape of the forest. At this point you realize that we are not in Chaos but ordered perfection. This one looks like a Hurricane, went through here! I love, how it's so desolate! I love the dichotomy between the Fall and Winter seasons in this one! Can you spot the Unicorn? This looks like where they would have hung out, hidden amongst the trees. Amazing. I feel so weird about the fact that I never had an idea that such landscape exists. It looks like out of a pc game! I've always wanted to go there. Now I'm sure I must include it in my kick-the-bucket list. There is an "other worldliness" to many of these pictures. They are exquisite but a challenge to the senses. It seems to be fall and winter at the same time. The bare mountain peaks seem so close to the areas of vegetation. It's stark and still yet the trees are windswept. There's a timelessness here. I think I could look at this landscape and be lost in it and my imagination for a very long time. Thank you Doru Oprisan for sharing this experience. Thank you for your kind comment! I was feeling many of the things you are writing about when I was there. It really is a place like no other. 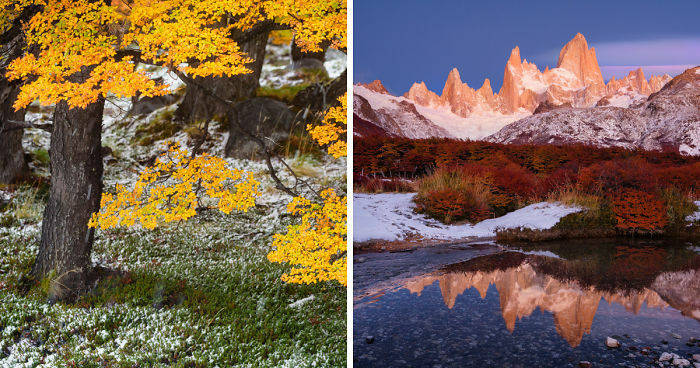 These are stunning, especially the autumnal coloured tress and tall mountains....Great photos!